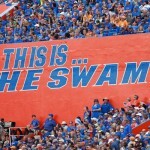 In what sounds like a flashback to a similar incident that occurred two years ago, multiple Florida Gators football players were written up for student conduct violations following an on-campus incident that occurred in late May involving a non-student and airsoft rifles. None of the players were charged with a crime, and it is unknown whether any violations were found to have occurred. After a witness called 911 about suspicious activity and noted that it looked like the individuals were carrying assault rifles, police responded to the scene and those in attendance fled. With video of the incident caught by a variety of security cameras at the Keys Residential Complex, players were eventually found and interviewed, though most reportedly denied knowledge of the incident at first. Sophomores wide receiver Kadarius Toney and defensive tackle Kyree Campbell, who brought the airsoft rifles to campus, were written up with UF Student Conduct & Conflict Resolution for the incident. The police report notes that both were “cooperative” during police interviews and “remorseful” for their actions that night. Redshirt senior TE C’yontai Lewis was also involved and brought a skillet as part of the incident, but it does not appear as if he was written up after being interviewed. A few other players were also interviewed as witnesses in the incident. It is unknown whether UF Student Conduct & Conflict Resolution determined that there were any student conduct violations or whether any violations have been imposed. 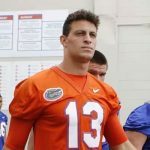 Zachery is not allowed to return to UF campus for three years. Two years ago, Cleveland and Wells saw reduced first-degree misdemeanor charges following an on-campus BB gun incident. The players were given a one-game suspension. 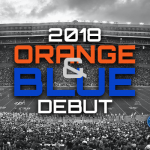 Gators director of player development Vernell Brown promised police that Florida football players would no longer possess the rifles on campus. The officer who compiled the report wrote that players now understand that they should contact police if and when similar circumstances arise in the future. First Coast News was the first to report on this topic.